Byron Bay Web Hosting Review 2019: Is Byron Bay Web Hosting a Good Hosting? Based in the coastal town of Byron Bay, Australia, Byron Bay Web Hosting takes pride in offering 300% green web hosting packages to local clients. In practice, this means that it purchases wind energy credits worth three times the amount of energy it uses. In addition to its eco-friendly hosting plans, Byron Bay also offers domain services, website design/development, search engine marketing (SEM) and search engine optimization (SEO), Google AdWords management, and SiteLock security packages. Byron Bay’s website is in English. Byron Bay Web Hosting offers four hosting plans: Lite, Business, Big Business, and Master Plan. It’s somewhat unusual in charging a setup fee, which most providers don’t charge these days. All green hosting plans use the cPanel control panel, and they vary in terms of web space (800 – 1800 MB), data transfer (7 – 51 GB), email accounts (5 – 70), and databases (1 – unlimited). The plans also feature the Linux operating system, MySQL databases, dual quad-core servers, 24/7 monitoring, and nightly backups. You even get free website scripts for WordPress, Joomla, Drupal, phpBB, and many more applications. Plus Python and Perl 5 support. Saving the planet doesn’t come cheap, so you might not be surprised to learn that Byron Bay Web Hosting’s green hosting plans cost more than double the industry average. And you also pay a setup fee. For some of you, it will be a small price to pay for the good that you will do. You can pay for plans in Australian dollars on a monthly, quarterly, biannual, annual, or biennial basis, with small savings for more significant commitments. The 30-day money-back guarantee might make you feel better about making a big commitment. Pay via PayPal, with a credit/debit card, or using a money order. 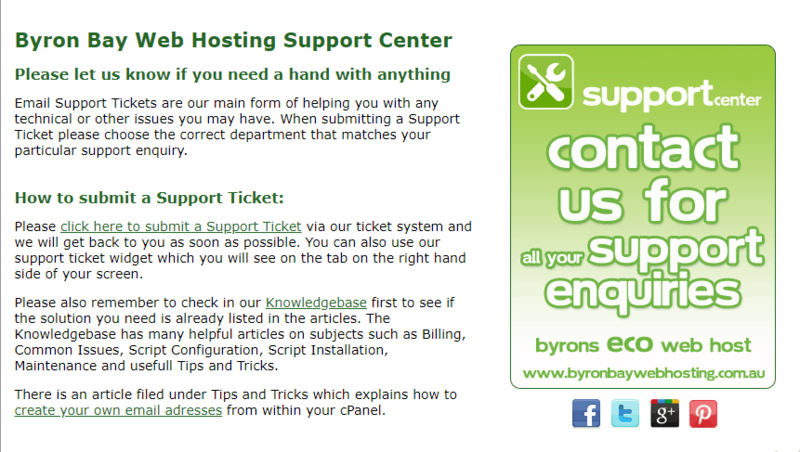 You can reach Byron Bay’s support staff by phone, email, or support ticket, with the company preferring you to use its ticket system to resolve your technical issues. I prefer live chat, but I duly submitted my test ticket… and received no response. If you’d like to save the planet while enjoying a quality Australian hosting solution, you could be happy with Byron Bay Web Hosting. But many of you might not be so keen when you consider the bandwidth limits, setup fees, and several other factors. 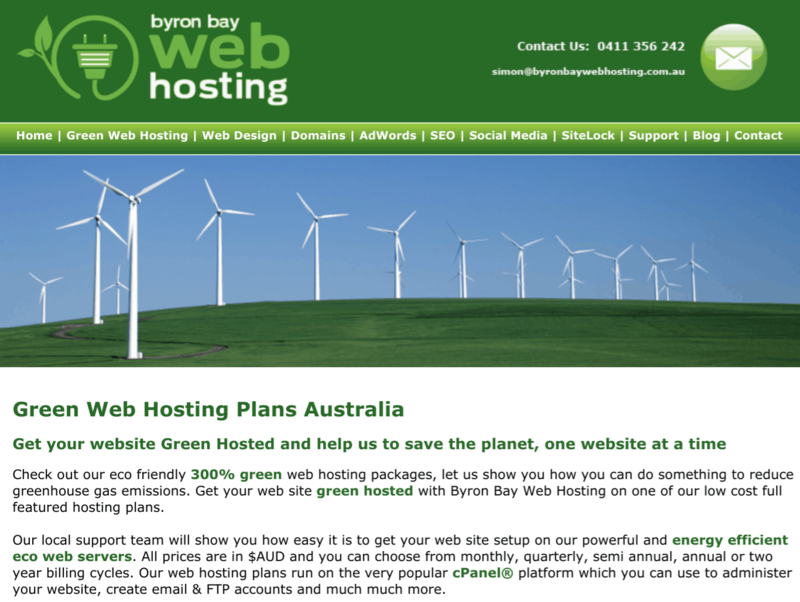 Go green with Byron Bay Web Hosting. Wondering how Byron Bay Web Hosting stacks up against other Web Hosting companies? Enter any other Web Hosting company and we will give you a side-by-side comparison.